AK Cheese Grater upper handguard arrived! Very nicely made product by guys from Khyber Customs– click on their name to go to their page and ask for info. Scope is PA ACSS 1-6x for 7.62×39 (link below) on American Defense MFG scout mount with RS Regulate 303 base + AKR upper. Magazine, shorty from Bad-Element Co. LLC . 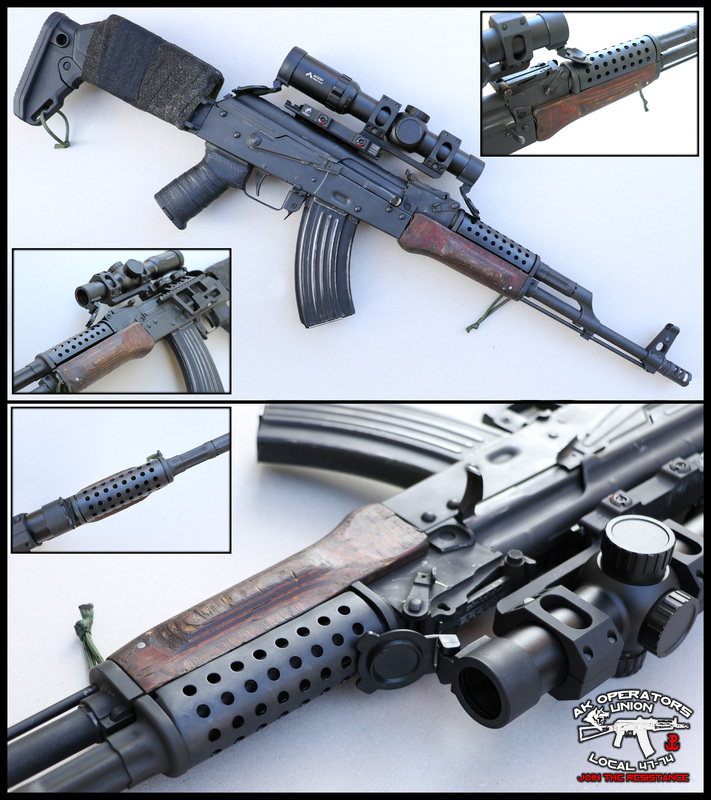 Stock, modified Magpul Zhukov + Magpul AK Grip with tennis rocket tape wrap (ha!). Rifle, good old trusty Definitive Arms LLC DAKM 4150N with Fighter brake. Rifle total weight: 8lbs 10oz (which is not that bad with scope setup). I’m posting links below if someone would like to make similar setup. Just got n-pap several people suggest using heavier recoil spring to reduce impact on rear trunion. What are your thoughts on this. Thanks really enjoy your videos very informative. I’d like to know this as well. Rob, please respond. I heard that this is somehow successful solution, but i don’t have my own feedback on it. In our 5k test, NPAP was running on original recoil spring and rifle ended with cracked receiver after 5k. I have one with 4k+ round count flawless/great aging shape, but my advice is to remove the dust cover retention button apparatus( the non mil-spec retention device) it just unscrews. I have hunch that apparatus gets seized with dirt and grime, and the recoil of the carrier drives it’s momentum into the retention device. also when it becomes seized it gets canted and makes a focal point for the energy of the recoil to be driven into, if you examine the design the recoil guide rod rides right over this retention screw and any kind of unevenness will once again to reiterate drive the momentum of the recoil into the rear trunnion at weird angles making the stress more localized to a certain point. I’m by no means a expert but I noticed after a few times out shooting and post shooting examination, this button gets seized and the profile is uneven and contacts the recoil rod foot unevenly, and just from what I saw I could totally see a rear trunnion failure happening with that condition. just remove its useless anyway. Juan, try to call Khyber Customs, they have some tricks for it. How is the heat dissipation on these? They help little bit, because they open up for hot air to move out instead of trapping it inside. I am having a set of Walnut Furniture made for my Arsenal SARM9F pistol grip and front furniture! Before I will stain them, I am toying with the idea of drilling some similar holes in the top front guard to near resemble the look of the steel/version in pics and hopefully help in heat dispersal. But I am swaying back and forth on that one, UMMM . should I should I not….